Critics focus on Paul Kuimet, winner of the Sadolin art prize for 2012, and the first photographer to win this contemporary art prize. KUNST. EE publishes two critical views: Jan Kaila and Japo Knuutila's discussion of Paul Kuimet and Mikko Rikala's joint exhibition "Clouds and Waves" at Hobusepea Gallery and Aliina Astrova's curatorial presentation at Paul Kuimet and Laura Toots' joint exhibition "Not Necessarily So" at Temnikova & Kasela Gallery. Paul Kuimet was announced the winner of the Sadolin art award and received 5,000 euros at the end of last year. First awarded in 1996 and launched again in 2012, this is the oldest art award funded with private capital in Estonia. This time there were three nominees: painter Merike Estna, photo artist Paul Kuimet and photographer and installation artist Sigrid Viir. The nominees were selected by a three-member jury of experts (Maria Arusoo, Helen Tammemäe, Andreas Trossek), and the winner was selected by the management of Akzo Nobel Baltics. This is the first time in the history of the award that the main prize has gone to an artist primarily focusing on photography; earlier winners have mostly been painters. A broader shift in paradigms? Knuutila: The exhibition "Clouds and Waves" at Hobusepea gallery yet again highlights the relationship between photography and reality; that is, is it possible to represent the surrounding reality with a photograph, or is this medium always either self-referential or referring to its creator or the photographer. Paul Kuimet and Mikko Rikala seem to establish the narrative of photography in the latter category. Kaila: Indeed, I wonder if the title of the exhibition is a metaphor for the relationship between reality and the photograph. Clouds would then denote the projection of the photographer; that is, the clouds would symbolise the photographer/artist's "inner" emotions as in Alfred Stieglitz' famous series "Equivalent" (1925–1931). Waves, on the other hand, would denote the self-referential quality of photography as a medium, waves do not really stick on the photograph, but remain only impressions. In this way, a photograph would not be a real medium, but self-referential instead. In addition, the name of the exhibition reminds me of another exhibition, at the Museum of Modern Art in New York: the classical ensemble "Mirrors and Windows" from 1978. Its curator, John Szarkowski, wanted to achieve the ideal photographic image that would be both a window to the world and a mirror reflecting the artist and the medium. Knuutila: Kuimet and Rikala genuinely seem to think that the camera does not act like a window or a mediator, but solely as a mirror. The issue of self-reference is not new or revolutionary in art, even though it might seem radical in galleries of modern art. For example, art of the Romantic period, Marcel Duchamp as well as Joseph Kosuth with their dry academic conceptual art issues seem to be breathing down Kuimet's and Rikala's necks. I'm just wondering if this is enough in today's world, I mean this tendency to contemplate the self-referential quality of photography? Kaila: It is, of course, significant that the exhibition is held in Tallinn. It seems that there is an interest in Estonia in fundamental conceptual art, where the focus lies in the self-referential quality of the piece itself. For example, one of the most important exhibitions during Tallinn's European Capital of Culture 2011 was "Beyond" at Kumu Art Museum, which was first and foremost a display of the self-reflective nature of the photograph. Perhaps Estonian photography is going through an academic phase, where the nature of representation is being discussed. Knuutila: Now would be a good opportunity to make a provocative comment. To a viewer who's unfamiliar with the fundamental tradition of conceptual art, this exhibition could seem rather strange: photographs of a reel, a goldfish, a photograph representing a goldfish, a line release; I'm referring to the piece "A Proposal for Realising Time/Subject" (2012). We could well ask, "What does all this mean?" Kaila: True. According to mainstream conceptual art, "Clouds and Waves" is introverted and allegorical art; and it risks drifting into narrative repetition, where pieces are about what they are about, while they're about what they are about and so on. In defence of Kuimet and Rikala, however, it must be said that they don't have a deadly serious attitude to their creations like Kosuth in his time; but they have a sense of humour about their art instead, like John Baldessari. 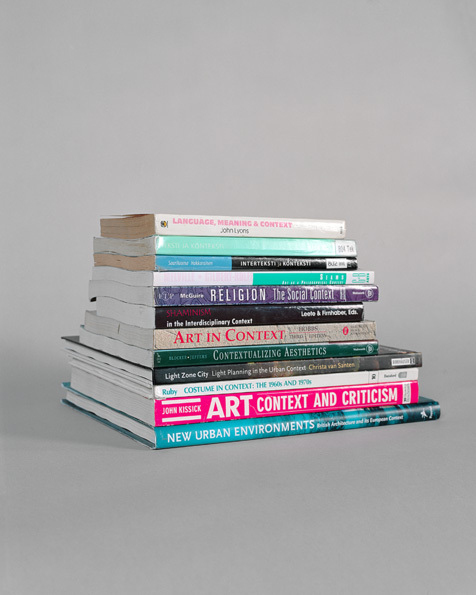 In the piece "Framework" (2012), the creators seem to overlay the effect of theory on photography with irony, which presents the main dogmas of art theory, or books, as art objects. Knuutila: Even in their irony, the artists strive for the autonomy of (photographic) art, and this seems difficult. Kaila: Perhaps this has been influenced by the difficult intermediate position photography has always had between applied photography and fine art. Kuimet and Rikala are, despite having studied in various places, young artists who might be concerned about their own freedom of expression – this exhibition can be seen as the manifestation of the artists' creativity, a declaration that photographers must be free to say what they want, it must be legitimate for photography to be among the fine arts. Knuutila: This right to be "in itself" reminds me of the problems of the 20th century rhetoric of American painting – I'm referring to the painter's arguments about the "purity" of the medium. As the Greenberg School put it – painting is colour, it is two-dimensional, and it does not tell a story… If we're talking in more general terms: why on earth have there been and still are such strong tendencies in modern and postmodern art to achieve autonomy; that is, to detach art from other social activities? Hasn't art functioned well over the past few centuries when dealing with common issues (like in politics)? Kaila: Perhaps not, perhaps not… It has been characteristic of photographers to discuss whether their work is art at all; whereas in painting, for example, the focus has been on how painting is conceived as art. It is strange that this almost neurotic quest on the part of photographers to gain acceptance still continues; they want to be artists with a capital A. It would be much more challenging if photographers were interested in matters outside their medium and the art market (if such things even exist anymore?). Knuutila: Let's go back to the "Clouds and Waves" exhibition in a concrete sense. This exhibition includes installations and even sublimations of various things; for example, the two rolls of film in the piece "Clouds and Waves" (2012). Kaila: An interesting piece, in that the two rolls of black and white film, placed on a light box and on a plinth, sort of form a sculpture and a monument at the same time – a historic marker of past times. Knuutila: But to what extent does this piece, for example, study the relationship between photography and power? Kaila: That remains completely unclear. I would like to finish by discussing the section of the piece "Frameworks" which comprises a slide show displaying the structures of the "Clouds and Waves" exhibition and, I presume, its construction or compilation. This piece contains interesting aspects related to mimesis, and it's not just reels of photographs. It is odd, eerie, to see the slide projector clonking along in nearly the same "reality" as the visitor to the exhibition. The artists were humorously ironic about the standard exhibition space: the gallery, the white cube, "large photographs in a row on the wall and that's it", and fragments of it. But I have to say, this sort of critique of the gallery space has been done a lot in contemporary art – there have been locked exhibitions, inaccessible to the viewers; there have been galleries filled with soil; and there have been presentation spaces solely for political meetings and so on. Knuutila: Perhaps the critical study of the exhibition context is for us – born in the 1950s – self-evidently a tradition from the 1960s or 1970s. Every generation is sure to experience these very same points of pain – us old geezers live in a completely different reality than the creators of "Clouds and Waves" – Mikko Rikala and Paul Kuimet, born in 1977 and 1984. Aliina Astrova: Concerns with the alienation of the general public from conceptual art practices tend to call for adjustments in the way art is mediated by its institutions and critics as a possible solution. The rate of public participation, it seems, will depend on how the former deal with making art accessible and the latter with making it understandable. Given that the institutions have a chance to fulfil their task of providing venues and programmes that are economically, socially and geographically approachable, the pressure falls on the critic to interpret the coded language of contemporary art to the presumably "ignorant" viewer. Often, this will entail matching the visual content of an art work with conceptual information that it possibly refers to, be it a historical fact, philosophical quotation or a political statement. Therefore, it is important to address from the outset what such "pressure to interpret" implies – for it affects not only the role assigned to the critic, but consequently most positions involved in the production and consumption of art. Although there is no doubt a need to provide the tools for at least a basic understanding of contemporary art, seeing the critic as the fulfiller of this task may be debilitating to all roles involved in the enactment of this understanding. To believe that art requires a critic on the fundamental level of interpretation would be to think of an artist as someone who produces work to be interpreted. That is, someone who merely assigns a visual form to ideas and references that the critic will later have to decipher. In such an instance, the critic himself will only be as good as his knowledge of art history is extensive, turning criticism into an almost mechanical process of matching visual codes with academic facts. To be sure, of such mechanical writing many examples exist in art criticism. And let's think further about the art work, which in such a situation is only a testament to its own production, irrelevant and misunderstood until an appropriate mediation is performed. The viewer’s position is equally infirm, awaiting the critic as a "remedy" for his/her "weakness". A more emancipating method would imply a rethinking of all the roles in such a way that each is being empowered. Equipped with—first and foremost—openness toward contemporary art, the viewer would be prepared to enter the exhibition space not to seek an explanation from a critic, but to meet the artwork. The role of the work would in itself imply a revealing quality. Its relationship with the space, its producers, its viewers, its medium will be arranged in such a way that intervenes in the usual logic of things, producing a shift (as opposed to merely producing a "slogan" that points towards something or references the already prevailing logic of things). It needs to recognize its own power as an object in a space and a situation. The artist will then be responsible for creating in such a way that would put the object, the space and the occurrence in play without defined rules. Finally, the viewer will enter not a "stagnant" narrative, where he/she is the last instance, a receiver, but an active space in which he/she can participate in the political process of making things visible, a space with a potential for appearance. Japo Knuutila is based in Kirkkonummi, Finland. He has exhibited in his home country and internationally since the 1980s and he teaches regularly at Lahti University of Applied Sciences. Jan Kaila is also based in Kirkkonummi, Finland. He is Professor of Artistic Research at the Finnish Academy of Fine Arts and has exhibited and taught in various countries in Europe as well as in America and Asia. Aliina Astrova works as an English editor for KUNST.EE.